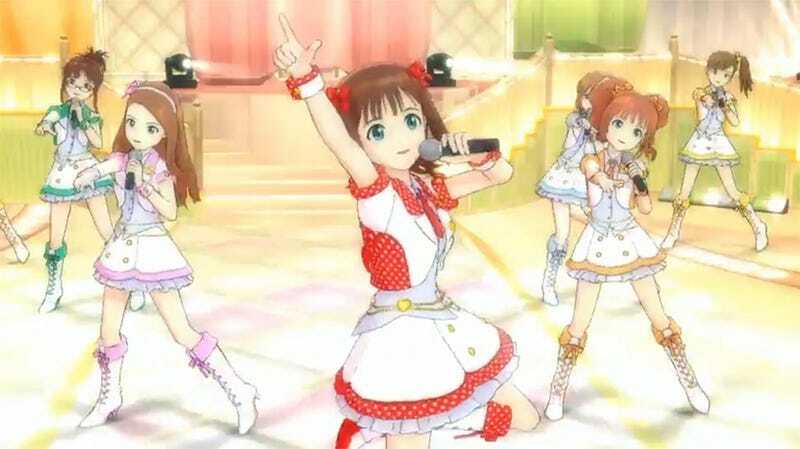 Since 2005, Namco Bandai's rhythm-tastic Idolmaster (Idolm@ster) series has been charming Japanese fans (and import gamers) at home and in arcades with its adorable anime style and J-pop music. Today, for the first time ever, there's Idolmaster available on the iPhone and iPad for the U.S., France, South Korea and Hong Kong, but it'll cost you nearly $170 to collect the whole set. An iOS port of The Idolmaster: Shiny Festa for the PlayStation Portable, the franchise's English-speaking debut is split into three different episodes — Harmonic Score, Melodic Disc and Rhythmic Record. Each includes different pop idols to manage, along with unique downloadable items and a 21-minute anime episode, subtitled in English. Each one also costs $54.99. So yeah. That's a tough sell. I've been a fan of the series for years, and I've often considered importing copies and attempting to play through the Japanese text. That's likely the more viable option here. I know folks that want this series really, really badly, but not that badly. Namco Bandai cannot be this silly, releasing $54.99 games into a market dominated by free and $.99 games. Either this is a licensing thing, or someone has gone completely insane in Namco Bandai's pricing department. What's the max you'd be willing to pay for a mobile game? How many times will it go into $54.99?